Honor the Earth map of current and proposed Line 3 routes. 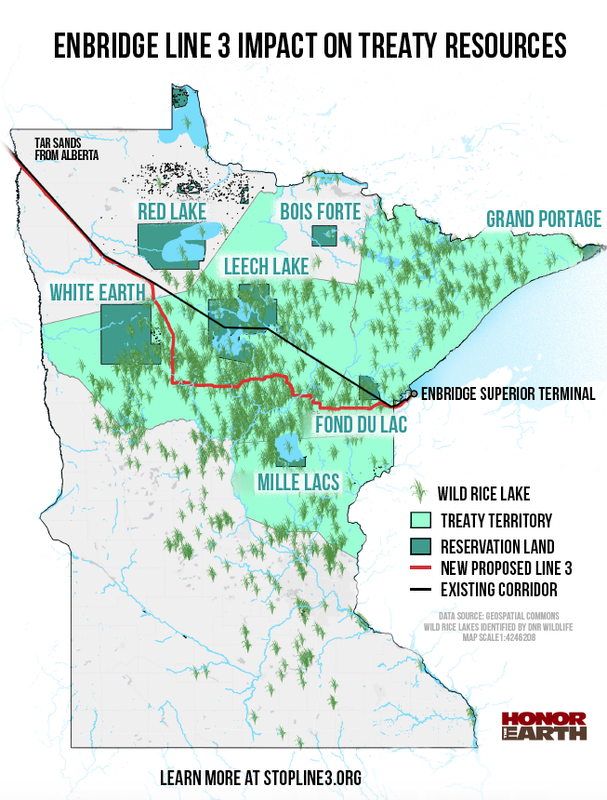 The Minnesota Public Utilities Commission (PUC) should reject Enbridge’s Line 3 proposal based on the biased and self-serving arguments Enbridge used during the regulatory review process. Minnesota needs credible partners in such major infrastructure projects. Administrative Law Judge Ann O’Reilly’s Line 3 report to the PUC identifies several key areas where Enbridge’s flawed arguments undercut its credibility as an honest broker of information. On the surface, O’Reilly’s report was something of a head scratcher, proposing an unpopular and unworkable option. She recommends taking the old pipeline out of its current trench and installing the new pipeline in the same trench. Enbridge wants to open a new pipeline corridor. It knows it won’t get permission from Leech Lake or Fond du Lac to run a new line through their reservations. Enbrige also wants to avoid the extra costs of removing the old pipeline, a bill it places at $1.2 billion. On the other side, the tribes don’t like O’Reilly’s recommendation. They not only want the pipelines off reservation land, but off the treaty territory where they have reserved rights to hunt, fish and gather. O’Reillly’s recommendation seems to leave the PUC in the lurch. Yet dig into O’Reilly’s report and you find damaging criticism of Enbridge’s testimony. First, Enbridge failed to adequately assess the environmental damage that its proposed new Line 3 corridor would create and ignores the culture impacts the project would have on the Anishinaabe people. Second, she disputes key parts of Enbridge’s expert testimony on the demand for crude oil — the essential facts the company needs to justify building a new pipeline. Lastly, she questions Enbridge’s credibility on the arguments it used to avoid having to pay to remove the old pipeline. The PUC needs to take these credibility issues to heart. It is expected to vote on Line 3 in June. The [Administrative Law Judge] does not find [Enbridge’s] testimony or analysis with respect to potential effects on lakes, groundwater, or wild rice waters credible or persuasive. Given the number of high quality surface, ground, and drinking water sources within or near [Enbridge’s preferred route], the impact of an accidental release on those important resources must be considered a weighty risk in approving this Project. That’s a damning statement. The PUC should be deeply concerned that a company seeking to build a major infrastructure project through our state’s cleanest water is so ignorant of the potential dangers. There are unique environmental concerns with establishing a new pipeline corridor. Trees cut down to construct a new pipeline would be permanently cleared. New water ways would be crossed by a crude oil pipeline where there was not one before, with all its appurtenant effects. According to the EIS [Environmental Impact Statement], the Project would have long-term to permanent/major impacts to 440 acres of wetlands and 2,202 acres of forests or woody Wetlands. Comment: In its risk-reward analysis, Enbridge shows little concern for the risks to Minnesota’s lakes and forests. [Enbridge’s] witness, Heidi Tillquist, testified that after an oil spill, “recovery of the natural environment and socioeconomic conditions” can occur, but will depend on numerous factors, … Consequently, “recovery” may take days, decades, or longer to occur. And recovery for spills that impact groundwater may take the longest. Comment: Why should the PUC trust a company which — as part of its environmental review — ignores the cultural impact on the loss of wild rice on indigenous peoples? Further, the PUC should be deeply concerned that, in the event of an inevitable spill, it could take “decades, or longer” to repair, and even then may never return to its natural condition. Enbridge needed to prove there is sufficient future demand for crude oil in order to justify building a new and larger line. It hired Neil Earnest, President of Muse, Stancil & Co., a consultancy specializing in the refining industry, to research the issue and testify on its behalf. In response, the Minnesota Department of Commerce hired its own experts to critique his report and its conclusions. … the CAPP member forecasts are biased by a variety of factors, including their need to satisfy shareholders and attract potential investors. Thus, the CAPP member forecasts should be assumed to be biased towards an optimistic assessment of future production. O’Reilly says these industry-based projections don’t include their underlying assumptions — and their reliability is “untested and unknown.” It puts their “accuracy” into question, she said. Comment: Enbridge is not credible or persuasive in analyzing the environmental impacts of Line 3, and now has its accuracy called into question when analyzing the need for more crude oil capacity. O’Reilly also pushes back on Enbridge’s assessment of the cost and complications of removing the old Line 3, instead of its preferred plan to abandon it in the ground. Apparently [Enbridge] believed that it was safe to install and operate six pipelines in one corridor, despite the use of heavy machinery for both installation and maintenance of those lines as recently as 2009. Its recent history of engineering skill speaks louder and more persuasively than its claim that inconvenient chores are dangerous ones. O’Reilly also criticizes Enbridge’s math on the issue of “timber mats”. During pipeline construction and removal, Enbridge uses timber mats under its heavy equipment to displace the weight and reduce the risks of damaging nearby pipelines. Enbridge and the EIS have huge discrepancies on the number of timber mats needed for the project. O’Reilly calls the EIS numbers: “more reasonable.” That is an understatement. According to O’Reilly, Enbridge claims it would need something on the order of 300,000 timber mats to remove the existing Line 3. An Enbridge witness testified getting that many timber mats may be difficult, but not impossible. Timber mats might seem like a relatively obscure issue, but it is part of Enbridge’s larger credibility issues. The significant discrepancy between [Enbridge] and the EIS estimates for timber mats highlights one of the several credibility issues the [Administrative Law Judge] has identified in this case when it comes to [Enbridge]. Comment: Enbridge is throwing out self-serving arguments to avoid its responsibility to clean up its own mess thinking no one will catch on. Thankfully, O’Reilly and the EIS did.